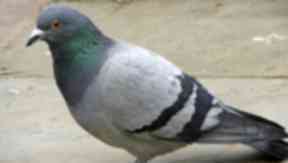 Craig Barrie has failed in a bid to keep his gamekeeper licence after he was caught using a pigeon as a decoy. A gamekeeper caught using a live pigeon to lure other birds into his sights has failed in a bid to keep his job. Craig Barrie used a live pigeon as a decoy to attract other birds on Aswanley Estate in Aberdeenshire in September 2019. The 30-year-old was fined £520 after he admitted the breach of the Wildlife and Countryside Act. He appealed the sentence, arguing that unless he was admonished or granted an absolute discharge he would lose his gamekeeper licence and be left unable to work. Two appeal court judges have rejected the argument on Wednesday. Lord Hardie said: "He must have been aware that it was a breach of his licence to have a live pigeon in a Larsen trap as a decoy for some other species. "If he did not know that, then it is astonishing given his 14 years as a gamekeeper and his father a gamekeeper before him." Barrie, of Glass, Huntly, has resigned from his job at the estate between Huntly and Dufftown but the post had been kept open for him in case the appeal was successful. Defence QC Paul McBride told the court that crows, hooded crows and magpies could be used as decoys, but not pigeons.